"If we aint friendly, we aint fast... and the food ain't GOOD - We need to know! If we can’t do it 100%, we won't do it at all!" Call ahead to reserve your party orders. If you are looking for the best barbeque restaurant in Columbia, Brickhouse Barbeque will be your last stop. 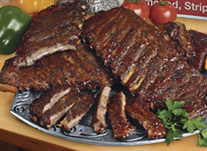 We have built Brickhouse Barbeque by consistently offering good quality food and friendly service to our customers. “Customer Satisfaction” has always been a top priority for us and something we are very proud of. Fresh, homemade, and high-quality aren’t just catchwords; they’re our foundation. Our commitment to food quality and genuine hospitality is unyielding and intense. We pride ourselves on our loyal guests, employees, and being a great place to have fun and sample some of the best Barbeque in the country. Our menu is firmly rooted in the traditions of Southern Barbeque, but there are other influences that shape our flavors and give our food its own distinctive character. That’s one of the secrets of great Barbeque – staying committed to tradition, but finding your own stamp and signature. If you are happy with our service and food, tell all your friends, family and co-workers! We give Police, Firefighters, EMT’s and Paramedics 1/2 off of single person order. Must be on duty to receive discount. Cannot be combined with daily specials, promotions, combos or coupons.